Shells Shrimp and Garlic Pasta is soo good. Cook the linguine and butter in salted boiling water until almost al dente. Drain and set aside. Combine olive oil, wine, garlic, salt and pepper, soy sauce and heavy cream in a large saucepan. 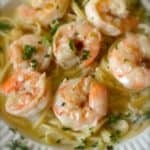 Add the shrimp, stir and add the linguine. 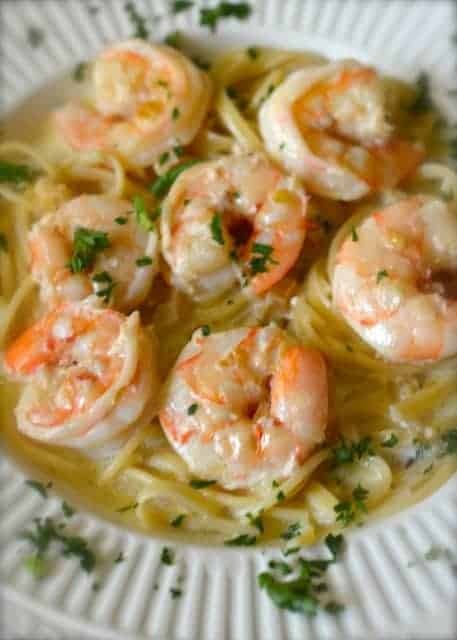 Stirring gently, cook over medium high heat for almost 10 minutes, or until shrimp is done and linguine is perfectly done. Serve at once. It will initially seem a little runny, but will set up and become a wonderful sauce. DO NOT USE HALF AND HALF! Don't cook it the full 10 minutes if it doesn't need it.